Have you ever really wanted to do something, but you weren't allowed? Maybe you weren't old enough, like our two younger boys find sometimes. Zachary is only 21 months younger than Aiden, so most of the time we have treated them pretty much the same. There have been times, though, when being younger meant that Zach couldn't do things Aiden could do, like when Aiden reached grade 5 and became eligible for cross-country running. Zach couldn't wait to get to grade 5 so he could join too. And now that he is in grade 5 (and cross-country running) he finds that Aiden, who is now 12, is going to youth rallies at church without him. And so, again, he's anxiously waiting for the next two years to pass so he can do the things his brother is doing. Sometimes it's not age that prevents us from doing the things we want to do. Sometimes it's qualifications, like when we want a better job but we don't have the rights skills. Sometimes it's money, like when we want to take a trip, but there are no extra funds to pay for it. Then there are times when we are included, when we can do something even though we're not quite qualified. Nathan sometimes struggles with being the youngest, and being left out when his older brothers are invited to a friend's house and Nathan isn't invited. There are other times, though, when everyone is here and they all play together. They include Nathan in their games, even though he is younger, which makes him feel so excited and happy. Do you see all the people who can't come into God's presence? All those who can't come near to the One who created them? But in verse 7 David writes, "But I...will come into your house; in reverence will I bow down toward your holy temple." Do you sense the relief in that "But I"? It's like David is saying, "But I'm not one of them. I'm not one of the ones who can't come near You. I'm allowed in." Why is David allowed in? What has he done to earn his way into God's presence? As I have written out verse 7, we could assume, perhaps, that David is perfect, and that's why he is allowed in God's presence. We could assume that he is not evil, or wicked, or arrogant. Perhaps those things are possible, but the rest of the passage presents a more difficult picture. It's hard to believe he never did wrong, or that he never told a lie. I think lying is hard-wired into every human. Certainly every child tries it at one time or another to attempt to get out of trouble. Even though we, hopefully, learn to be truthful, I doubt any person, aside from Jesus, has ever lived who never told a single lie. And if we read our Bibles, we learn that David certainly wasn't a perfect man, allowed into God's presence because he never did wrong. Read the story of David and Bathsheba to see just how much wrong David was capable of doing. No, it's not because he's perfect that David is allowed into God's presence. I'm grateful for that, because if that was the answer it wouldn't give us much hope. I have a hard time being perfect. Do you? Thankfully, the answer lies in four beautiful words that I left out when I first typed verse 7 for you. These four words not only explain why David could come into God's presence, but why we can as well. They offer hope and peace and salvation to any who choose to believe. The full verse reads, "But I, by your great mercy, will come into your house; in reverence will I bow down toward your holy temple" (emphasis mine). Not because David was perfect. Not because I am perfect, but because God is merciful and gracious, willing to forgive those who repent and ask for forgiveness. In David's day that required animal sacrifices, but for us Jesus has already made that sacrifice. It is done and God, by his great mercy, welcomes anyone who accepts that sacrifice as having been made for them. If we believe that Jesus is our Savior, then we can say with David that we are not like those others, who are not welcome in God's presence, simply because we have chosen to accept the gift of mercy being offered to us. Those others, should they ever choose to accept his mercy, would also find themselves suddenly welcome, suddenly allowed in. Then they too could say, with relief and excitement and joy, "But I, by your great mercy, will come into your house." 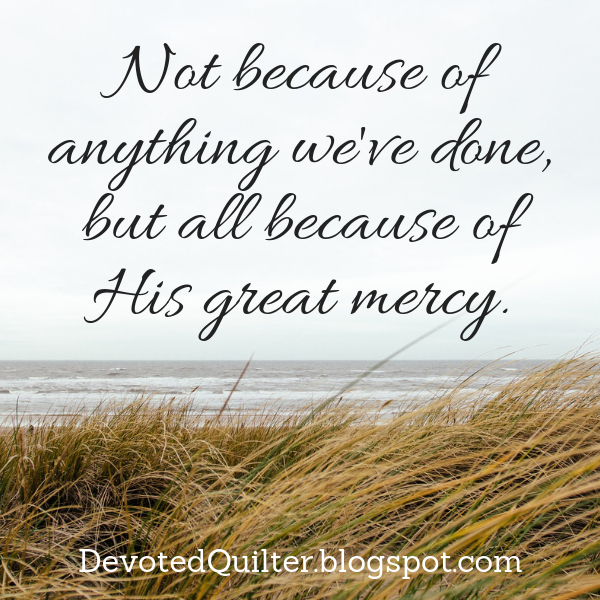 Thank you, Father, for your great mercy towards us.